If you work in a health and safety role, there is one question that can make for an awkward conversation: “So, what do you do?” I was asked this question at passport control on entering the UK on my Australian passport. I considered my options: safety specialist, ergonomist or psychologist. All three come with baggage; they trigger different preconceptions. As he was an immigration officer in the border security business, I replied “I’m a safety officer“, modifying my job title. He continued to check my passport, and asked, “So, do you think we have too much safety nowadays?” I thought this was a curious question to ask with the smell of a safely-landed B737 still fresh in the air. Then I realised what he meant. “Oh…no, I’m an aviation safety specialist!” I exclaimed. This pleased him. He stamped my passport and let me on my way. Aviation is, by most measures, the safest form of transport in the world, and 2012 was the safest year on record for Western-built jets. The number of people killed in such fatal aircraft accident crashes was 414 in 2012. Consider this alongside the 4000 or so domestic accident fatalities per year in the UK alone. But dying in an airplane accident is much more devastating to imagine than dying falling from a ladder, and this vividness and emotional impact dominates abstract notions of statistical probability. Somehow, safety in mundane situations is mocked in society, while safety in other contexts such as aviation and nuclear power is seen as worthy. Sadly, through myth and legend, ‘health and safety’ became the stuff of ridicule. This is easily demonstrated via a cursory scan of news headlines, stories and comments, with both reasonable and unreasonable interventions being subject to attack. Even the United Kingdom’s Prime Minister, David Cameron weighed in, in 2012, with a new year’s resolution to “kill off the health and safety culture for good“. He didn’t hold back. He said the government was “waging war against the excessive health and safety culture that has become an albatross around the neck of British businesses”. Cameron invoked a “health and safety monster” and described a “culture of fear”. He revealed he had asked the Health and Safety Executive to bring forward to the end of 2012 its timetable for abolishing or consolidating up to half of all existing regulations. He meant business. Richard Jones, head of policy and public affairs at The Institution of Occupational Safety and Health was appalled. He laid the blame not with the law, “but rather, exaggerated fear of being sued, fed by aggressive marketing”. Others laid the blame on ‘jobsworth’ restrictions on freedom by heavy-handed or confused officials, in the name – but not the spirit – of ‘health and safety’. Perhaps this prompted the UK’s Health and Safety Executive to launch a website aimed at busting the health and safety myths. The HSE panel has so far considered 229 cases, including Parents banned from using mobile phones in school grounds, Kettles banned from hotel bedrooms, and Children not allowed to use a drinking water machine in a children’s centre. How did it come to be that the British Prime Minister denounced ‘health and safety culture’ and that the UK Health and Safety Executive had to create a special panel and website to “challenge potentially disproportionate or inaccurate advice or decisions, made in the name of health and safety”. How did ‘health and safety’ become a guise? Perhaps the health and safety profession itself contributed to the conception of a health and safety monster. Our professions – from our initial training, through to our first job and on the job training, to deep acculturation – have a profound effect on how we operate in the world. First, profession acts as a lens that affects how we see and understand the world. Second, it plants and nourishes a set of self-propagating habits that affect how we respond and interact. Warnotte put this down to “la déformation professionnelle du fonctionnaire” – a play on words referring to the job conditioning or acclimatisation of officials. The paragraph, published in 1937, could have been written to describe the public perception of ‘health and safety’ today. Perhaps déformation professionnelle distorted the profession’s view of the world, and finally turned back on itself like a fairground mirror, reflecting unpopular features of the profession – a focus on failure, constraints, and sanction. In many professions, we unwittingly develop particular conceptions about people and systems. We rarely question them, and others rarely question us about them. Our views are partial and distorted to fit a particular professional purpose and paradigm. This is achieved via a set of lenses that can be labelled what, who, where, when, how, and why. Each lens has micro, meso, or macro apertures. Our professions drive a preference for particular lens types and particular apertures. Our partial view of person is symbolised by specific labels that focus attention, including ‘consumer’ (marketing), ‘prospect’ (sales), ‘patient’ (medicine), ‘defendent’ (law), ‘subject’ (science), ‘user’ (design, ergonomics, UX), and ‘operator’ (process safety). Each has a practical purpose, but often orients toward the purposes of the profession. Partiality of perspective is apparent even within the same profession; consider the perspectives of the neuropsychologist, the cognitive psychologist, the humanistic psychologist and the social psychologist. With regard to systems, we similarly focus on a particular component or part, in a particular way, for a particular time, and for a particular purpose. Our view of the person – even the same person – is further distorted by profession; consider the perspectives of the police officer, the prosecutor, the lawyer, the judge, the nurse, the doctor, the psychotherapist, the social worker, the community worker, and the marketeer. Distortion extends to our view of systems, even the goal of the system. While ‘safety first’ is the motto of most safety-related industries, the real goal – whether expressed or not – is (business) survival. As such, sub-goals such as productivity, growth, profitability, safety, and sustainability compete for attention and are pulled in each direction by different professional groups. Déformation professionnelle may also give us a partial and distorted view of safety. The prevailing paradigm, which Erik Hollnagel has labelled Safety-I, is defined by as few things as possible going wrong. The focus is on adverse outcomes and ‘unacceptable’ risks, which are assumed to have identifiable causes – the causality credo. With this perspective, we attempt to decompose systems and identify faults and failures. In safety management, the human is predominantly viewed from the perspective of failure, and particularly how the person contributes to it. The safety management principle is to respond to occurrences and identified risks. Once this perspective becomes hard-wired into our goals, policies, tools and methods, the tracks have been laid, and it becomes difficult to change direction. It is curious that most safety-related front-line professions – including anyone who interacts with hazardous processes or technology – tend to focus on how to do something right. In training, procedures, working methods and so on, the focus is on a positive goal and how to achieve it. The safety management profession focuses on a negative goal (accidents) and how to avoid it. As such, it has little to say about effectiveness as a whole – only how to avoid disaster. As literary theorist Kenneth Burke put it, “A way of seeing is also a way of not seeing — a focus upon object A involves a neglect of object B” (1935, 1984, p. 49). A focus upon failure means a neglect of success. Burke gave the droll example that “the poor pedestrian abilities of a fish are clearly explainable in terms of his excellence as a swimmer“. Could it be that, in the safety management, our Safety-I abilities function as blind spots, leaving us unable to see the variety and the everyday success of work-as-done? Have we lost the agility and flexibility to respond to our fast changing world, preferring the well-known concepts and methods from our past training? If so, our interventions may well result in inappropriate interventions. 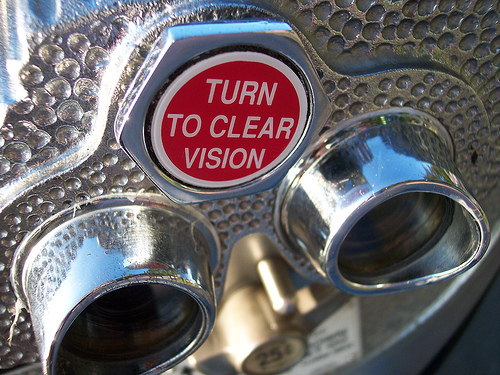 Hollnagel’s Safety-II may help to clear these blind spots and stretch our abilities. Safety-II is defined by as many things as possible going right. The focus is all possible activity and outcomes, especially typical ones. Rather than linear causality, Safety-II is characterised by emergence, and founded on performance adjustments & performance variability. The human is therefore viewed as a resource necessary for system flexibility and resilience. Safety-II provides the same set of lenses and apertures but they are selected and used differently, with less emphasis on who failed and how they failed, and more emphasis on how the system really works, and why it works the way it works. It offers the opportunity to reduce partiality by focusing on the whole range of activities, not just those that go (or may go) wrong. It also offers the opportunity to reduce distortion by looking at work-as-done – how the work really works – rather than work-as-imagined. With a clearer perspective, it is possible to anticipate developments and events, and understand conditions where performance variability can become difficult or impossible to monitor and control. Hollnagel does not suggest that Safety-I is discarded. But a narrow focus on failure will always be unpalatable outside the profession – especially with front-line personnel who experience work-as-done and leaders who fear a safety monster. Moving toward Safety-II means moving toward effectiveness rather than simply away from failure. By understanding effectiveness more holistically and clearly, it is possible to derive benefits beyond safety. Burke, K. (1984) Permanence and Change. Third Edition. New York: New Republic. EUROCONTROL (2013). From Safety-I to Safety-II: A White Paper. Brussels: EUROCONTROL. Merton, R. K. (1957). Social Theory and Social Structure. Glencoe, IL: Free Press, pp. 195-206. Veblen, T. (1914). The Instinct of Workmanship and the State of the Industrial Arts . New York: Macmillian. Warnotte, D. (1937). Bureaucratie et fonctionnarisme. Revue de l’Institut de Sociologie, 17: 245-260. This entry was posted in Humanistic Psychology, Safety, systems thinking and tagged assets, déformation professionnelle, deficits, deformation professionelle, health and safety, Language, paradigm, profession, safety, safety culture, safety-I, safety-II, trained incapacity. Bookmark the permalink.